If you are a fan of doing home improvement, you should have a good drill that you can use for practically any project around the house. One of the best drills you can get in the market is the DeWalt DCD760KL 18V 1/2 Inch Cordless Compact Lithium-Ion Drill/Driver Kit. Like Dewalt, there is another drill kit which is panasonic drill kit. In this review, we will be taking a closer look at the DeWalt DCD760KL 18V Drill. Read on if you are interested in getting this drill for yourself. At roughly 4 lbs, the DCD760KL is one of the lightest cordless drills today and this is important because the weight is a very important issue with these tools. Jobs can take hours to complete and with the tool’s batteries lasting up to 5 hours, you need to have something that you can comfortably carry in your hands. At just over 4 lbs, it is definitely a well-designed tool. The size also makes it ideal to use when you have tight spaces to contend with. In addition to the weight, all of DeWalt’s cordless compact drills have been designed with very good ergonomics. The grip is comfortable in the hand and this also adds to user comfort. Lithium Ion batters last long on a single charge. Many users have reported that they have worked with their batteries for up to 5 hours on a single 30-minute charge. In addition to that, Lithium Ion batteries are good till the end, unlike their NiCad counterparts that slow down as it looses power, Lithium Ion batteries keep pushing on. Charging this cordless drill is also a dream. It can charge to full in as little as 30 minutes. If you do not have a charged batter handy, you can just pop the battery onto the charger, take a small coffee break or lunch and come back to a fully-charged battery. The charger also works with many other batteries from DeWalt. The tool also offers power and great versatility as it is available in dual speed settings (0-500/0-1700 rpm). You can choose the speed appropriate for whatever task you are doing. “I bought this drill when I was screening in our patio and was tired of unplugging the d@mn corded drill I was using and the person who was working with me had a different brand cordless drill. Brought this one home, dropped battery into charger and SHAZAM! 60 minutes later I was rocking and rolling. Because it was there and I thought I might need it I dropped the second battery in the charger while I was using the first. To my surprise I didn’t need it that day. This tool made the job a whole lot easier on me in more ways than just not unplugging the cord. The Dewalt was much lighter than the older craftsman drill with a bunch more power and torque. I am not sure I understand the comments about the drill not having enough power, When I was screwing the framing for the patio it the drill would not only drive the screws in but countersink them without even a complaint. I would have most likely just kept going until the screws came out the other side of the boards. Overall, if you are going to use this drill for Do It Yourself jobs around the home it will work all day and come back for more. One of the main complaints you hear from those who have used the DCD760KL is that the chuck can be hard to loosen. Things get better as the drill is put through its paces. For the most part, this is seen as a positive as opposed to other drills with chucks that loosen involuntarily and those that have bits that wobble. This 18V Lithium Ion Cordless Compact Drill/Driver is available from Amazon. You can learn more about this Dewalt 18V drill from the DeWALT website. It also features information about other products from the brand including their other Cordless Compact Drills and their Drill Drivers. The DCD760KL is definitely one of the best new drills out in the market today. If you are looking to get your first drill or if you just want to add to an already active set of tools, then it is a great choice. It is extremely powerful and drill/driver features make it a versatile tool indeed. 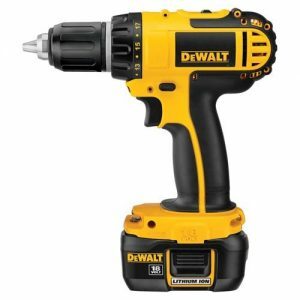 If you want to get the Dewalt DCD760KL Drill, head on to Amazoin.com.